Mississippi River cruise itineraries are usually separated into the Upper and Lower part of the river. The Upper Mississippi is generally considered to be between St. Louis, Missouri and St. Paul, Minnesota; and the Lower Mississippi is between Memphis, Tennessee and New Orleans, Louisiana. Cruises are sometimes combined with other waterways, such as the Ohio River and the Tennessee River. Since the weather tends to be warmer in the southeastern United States, travel on the Lower Mississippi is available during most of the year; while cruises on the Upper Mississippi are more seasonal and usually only available between June and October. The Mississippi River is is one of the longest rivers in the world and the second longest river in the United States after the Missouri River. From northern Minnesota, the Mississippi flows for 2,340 miles and passes through or borders 10 different states before reaching its mouth at the Gulf of Mexico. The Mississippi River has 12 tributaries. With regard to river cruises, the Ohio River is its major tributary. The two rivers actually meet twice – in Cairo, IL where the mouth of the Ohio River is located and also near Paducah, KY.
As previously mentioned, cruises on the Upper Mississippi are seasonal and only available between June and October, which means options are more limited. Average itinerary length is usually eight to nine days. And the most common itineraries are between St. Louis, MO and St. Paul, MN. There are also a few cruises available between St. Louis and Ottawa, IL (Chicago), St. Louis and Memphis and round-trip from Red Wing, MN (Minneapolis). Some packages combine travel on the Mississippi with the Ohio River and may include travel to cities, such as Pittsburgh, Louisville, KY and Cincinnati ,OH. However, most of the cruise is on the Ohio River and not the Mississippi. So for those travelers looking for a Mississippi River cruise, these may not be the best option. The Cumberland River is another waterway that is sometimes combined with a Mississippi River cruise. This river is indirectly connected to the Mississippi through the Ohio River. Nashville and Clarksville, TN are located on the Cumberland River and are featured in a couple of itineraries. These cruises are between St. Louis and Nashville and an equal amount of time is spent on the Cumberland and Mississippi Rivers. 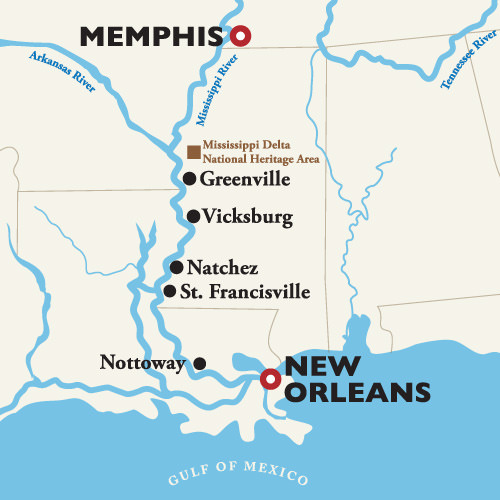 There are also several itineraries available on the Lower Mississippi between Memphis and New Orleans. These cruises are typically between 8 and 9 days long. There are also 5- to 6-day packages that are round trip from New Orleans. Unlike the Upper Mississippi, cruises on the Lower Mississippi are available throughout most of the year, with the exception of mid-January thru late February. And similar to cruises in Europe, there are themed itineraries available during the winter holidays, including Thanksgiving, Christmas and New Year’s Eve/Day. In addition to Upper Mississippi and Lower Mississippi River cruises, there are a couple of itineraries available each year that combine both. These cruises are between New Orleans and St. Paul, MN and are 16 to 22 days long. American Cruise Lines offers Mississippi River cruises year-round. The company features three ships with a guest capacity between 150 and 185. Stateroom size is generous on all of these ships starting at 200 to 250 square feet for the smallest staterooms. Largest staterooms are between 450 and 900 square feet. All three ships are newly built for the Mississippi. Ships on the Mississippi: America and Queen of the Mississippi. Coming in October of 2018, American Song, the first in a new five-ship series to operate on the Mississippi. Staterooms on American Song, and its sisters, will range from 250 square feet to 900 square feet, and all staterooms will feature private furnished balconies along with floor-to-ceiling sliding glass doors for optimal viewing. Important to Note: American Cruise Lines features a selection of single cabins with no solo supplements. American Queen Steamboat Company cruises are available year round, but they are seasonal in nature. Travel on the Upper Mississippi is available from June or July to October. The remainder of the year, cruises are available on the Lower Mississippi between Memphis and New Orleans. The company has two vessels that operates on the Mississippi River. The American Queen is the largest steamboat in history. Passenger capacity is 436. Staterooms are smaller than those featured on other cruises ships, though. They begin at 132 square feet. The American Duchess is a smaller vessel, carrying up to 166 passengers. 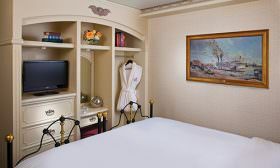 The staterooms are larger on this ship – between 180 and 550 square feet. Interesting to Note: Each sailing for American Queen Steamboat Company is listed as a separate itinerary. All itineraries have a specific theme. This is a general overview that looks at and compares the most popular itinerary for the Upper and Lower Mississippi River cruises for both companies. 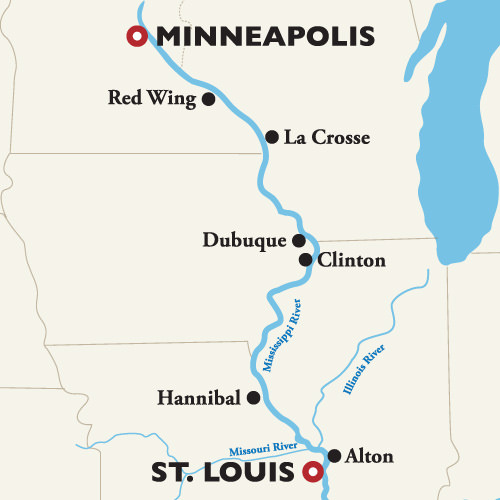 We first look at itineraries on the Upper Mississippi River from St. Louis to St. Paul, MN or Red Wing, MN. One thing to note is that the ending point for these itineraries are different. American Queen Steamboat Company travels from St. Louis to Red Wing, and American Cruise Lines travels from St. Louis to St. Paul. To put things in perspective, Red Wing is about 54 miles southeast of Minneapolis, and St. Paul is about 12 miles east of Minneapolis. *Starting rates are based on Category AQ-E (Inside Stateroom). These rooms are between 132 and 140 square feet in size. **Gratuities are calculated at $17.50 per day/per guest. These fees are either prepaid or collected at the end of your trip. *Starting rates are based on Category A (Outside Stateroom with a large picture window). These rooms are 290 square feet in size. ** American Cruise Lines says "Guests are not expected to leave a gratuity." Now, let's take a look at how cruises on the Lower Mississippi River compare between the two companies. The most popular itinerary is between Memphis and New Orleans. **Gratuities are calculated at $17.50 per day/per guest. These fees are either prepaid or collected at the end of your trip. *Starting rates are based on Category A (Outside Stateroom with a large picture). These staterooms are 290 square feet in size for the America and Queen of the Mississippi. Category A staterooms on the American Song are slightly larger (304 square feet) and feature a private balcony. Cruises on the American Song will be available beginning in October 2018. What’s the Best Choice for a 2018 Mississippi River Cruise? If cost is your key consideration, then American Queen Steamboat Company is the clear winner, with per diems beginning at around $260 per person. American Cruise Lines will cost you nearly twice that much, but you get more than twice the cabin size on American Cruise Lines. Interior cabins measuring 140 square feet or less, such as the Category AQ-E on American Queen can feel a bit squeezed, when compared to the 290-square-foot Category A interior cabins on American Cruise Lines’ Queen of the Mississippi. So yes, American Queen Steamboat Company has more attractive lead-in rates when compared to American Cruise Lines, but the difference is in the cabins. Moving up to a Category AQ-D with Bay Window on American Queen, increases the per person rate to $3,299 for 190 square feet of space. Rates were obtained from the respective company's websites in February 2018. For $3,999 you could get the 290-square-foot cabin with window on American Cruise Lines or a 190-squaere-foot cabin with balcony on American Queen. In that regard, we consider American Cruise Lines to be the better value, but then a balcony is a nice feature, so you’ll need to weigh the balcony against the additional space. Of course, both companies offer cabins that are larger (and smaller) than their standard offerings. Queen of Mississippi’s Owner’s Suite measures 445 square feet, while its single staterooms measure 203 square feet with no balcony and 230 square feet with a balcony. American Cruise Lines’ best value on Queen of the Mississippi is probably the 304-square-foot Private Balcony staterooms. American Queen’s American Duchess is an all-suite paddewheeler. That doesn’t mean you’ll have two-room suites, though. Rather, that’s the company’s marketing speak. Staterooms, as we prefer to call them, range from 180 square feet to 550 square feet. American Duchess does feature something we’ve not seen on the Mississippi: Loft Suites that measure at 550 square feet. The lower level features a full bathroom, small dining area, a lounge section furnished with a queen sofa-bed and desk area, along with sliding doors to access a private balcony. The loft area upstairs features a semi-private bedroom, a full bathroom and closet space. If you prefer to cruise on a smaller vessel, American Cruise Lines offers the best option. Guest capacity is less than 200 passengers for all three ships. And, as noted, stateroom size is significantly larger compared to its competitors on the Mississippi. 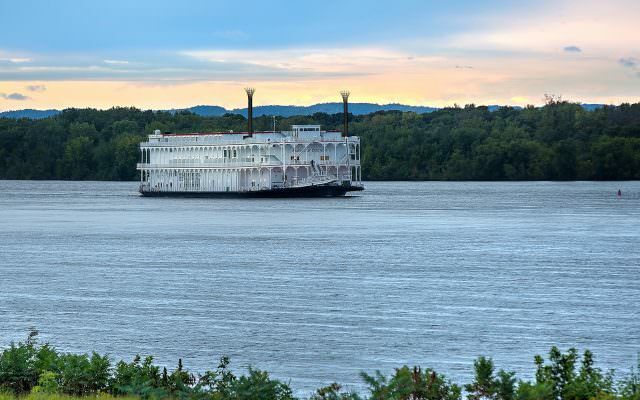 American Queen Steamboat Company offers a greater variety of themed-cruises, and if you prefer a larger ship, American Queen Steamboat Company is the better choice. The American Queen steamboat carries 436 passengers. See Ralph Grizzle’s video reviews of the American Queen. Read Other Articles About the Mississippi River.